Here's where the original is. 1. 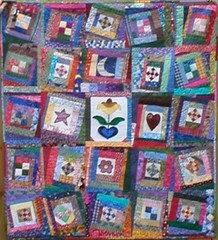 Have you ever participated in a Mystery Quilt project? I started to say "no" - but actually I took a class from Charlotte Angotti once, and that was essentially what it was. 2. 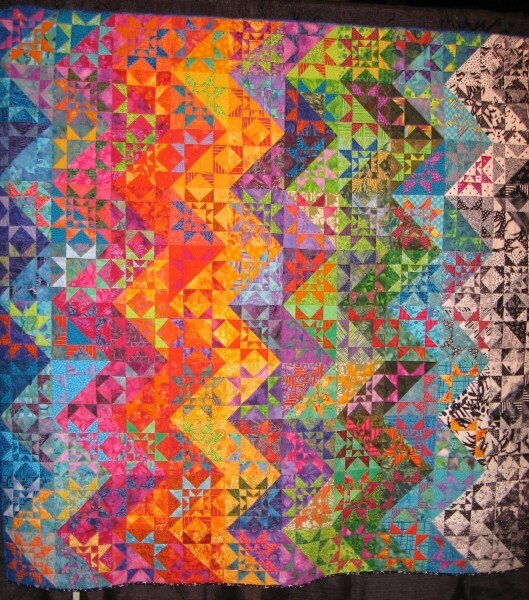 What concerns do you have with doing a Mystery Quilt? That I won't like the quilt when it's done! 4. Do you enjoy reading mystery genre books? Yup. I've been reading Anne Perry's two Victorian-era mystery series for the last several years - I'm finally about to run out of them. I like the Sue Grafton alphabet mysteries quite a lot, too. 5. Do you like surprises? Y'know, I am kinda iffy about them, really. If the person trying to surprise me really knows me well enough to know what I like, then yes. Otherwise, it's a big waste of time and money. A couple more - I will probably add more later. 1. What is your favorite color? I like practically all colors, and the answer to this tends to vary according to when you ask me, but I have been very drawn to green lately. So let's go with green. 2. What is your less favorite color? Beige. 3. What is you favorite color combo? I love blue and green. 4. What is your less favorite color combo? I'm sorry to have to say this, but I loathe red, white and blue unless you vary the colors somewhat. Made by Sonia Brown, who I think may have a book out with this in it. 1. Have you ever made a garment that incorporated quilting techniques? I don't really make garments any more. For one thing, I am a 'big' girl, and quilted clothing just adds more bulk. I don't think quilted clothing is very flattering to most people unless they're really skinny or the clothing is really, really well cut. 2. Have you ever cut yourself with your rotary cutter? Or sewn yourself? Or other quilting related injury? I am pretty paranoid about my rotary cutter because I could totally see myself doing one of those things. I have cut myself but only very slightly. And amazingly, I have never sewn through my finger. 5. Have you ever put in a 'joke' in one of your projects? Like putting a meat-shaped piece of fabric in a quilt intended for a vegan? Well, I made a quilt that ended up being called "The Kitchen Sink Quilt" because I put all sorts of bits and pieces of different things into it. Also, a friend and I made a quilt for another friend whose nickname was "guppy" and we put a fish fabric on the back and I quilted a tiny fish on the front. 1. What is your favourite pattern? I'd probably go with Log Cabin because you can do so many different things with it. 2. What is your favourite technique? Um. Just plain ol' machine piecing, I guess! 3. What technique would you most like to learn? I'm not really at a place with the quilting where I'm worried about learning to do new things right now. I'd just like to have time to practice the old ones! 5. What is your least favourite technique? I'll go with applique. 1. Do you have a favorite type/brand of pins you use for quilting? If so, what? I don't really use pins any more than I have to. I'm bad about dropping them and since I never wear shoes in the house, I am very opposed to stepping on them. However, when I have to use them I prefer the flower-head ones. 3. Do you own any specialty/vintage/otherwise special quilting pins? Those bent safety pins for quilting, which I much prefer for pin-basting. I have a whole bunch of those. And I think I inherited some very expensive extra-skinny applique pins from my mother. 4. What do you use to pick up pins that fall when you work? Well, as I said, I don't use them more than I have to and I try not to drop them in the first place. But I do have one of those magnetic things (also my mom's) to pick them up with. She left a trail of pins all over her house, you had to be very careful there! 5. About how many pins do you think you have? Good lord, no idea. Of my own, probably a couple of hundred, easily, and then I inherited more of my mother's. Probably thousands, easily. 1. Are you part of group that meets to sew? Not right now. I need a new group. I quit going to my old one because it was too far away. 2. Have you invited friends over to quilt/sew? No - for a long time I didn't have enough room for me to sew, much less anybody else. Now that I do, I need to do some inviting, clearly! 3. Would you be interested in an "online sewing day"? Yeah, I guess I would - I have been having trouble being productive, maybe that would help! karen_d and I made this a couple of years ago for the wedding of two of our online friends. Karen lives in Michigan and I live in Texas, but we still quilt together occasionally! We both made subunits - I made the centers, which were sampler-type blocks, and she made the other Ohio Star subunits - and I spent one weekend at her house, which was when we assembled it. 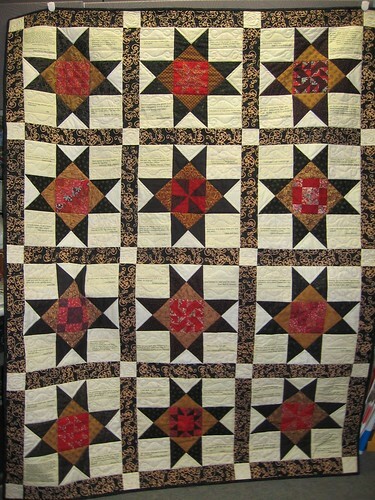 Then she did part of the quilting and mailed it to me and I did some more. So it was truly a joint effort. As you go back in time with these, I talk more and more about my mom, and "my mom's stuff" comes up a lot. If you don't know the history, she had died early in 2007, and I spent most of that year, off and on, cleaning out her townhouse. So that's why that looms so large here - "mom's stuff" has its own tag, isn't that sad? 1. Do you subscribe to quilt magazines (get them in your mail box monthly)? Definitely - they're much cheaper that way! 2. What is your favorite and why? It used to be QNM but they went downhill for a while. (And I haven't read one lately so I don't know if they've recovered.) 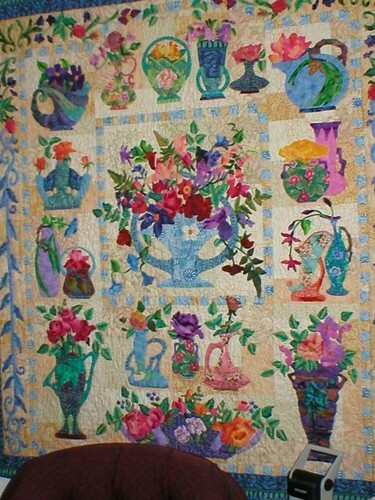 I like Quilting Arts a lot for the artsy end of things. I'm not sure which one on the traditional side is my favorite these days - I like several of them. 3. Do you save all your magazines? No, I used to but they took up too much space. Nowadays I scan the stuff I'm interested in keeping. 4. Would you be interested in a magazine swap? I never thought about it, but maybe! How much does it cost to mail a magazine? 5. How many magazines to you purchase during a month (not including subscriptions)? Lately I've been buying a couple a month. Oh, I haven't thought to pass this along: if you have a Sam's Club in your area, they have had quilting magazines mixed in with the rest of their magazines lately, and they're discounted quite a bit. So if you're too cheap to buy many at full price, like me, that's a way to get more of them without subscribing. And also, Amazon's 4-for-3 deal (basically, buy 3, get one free) is on single issues of magazines as well as paperbacks, and they also have quilt and craft magazines in their selection. 2. What is your favorite winter bird? Um, I would say cardinals but we don't actually get them around here that I've seen. I live in a weird place. Sometimes in the winter I see white pelicans! 3. Have you ever done a "winter" specific quilt/project? No, but one of these days I want to. Something with a snowflake theme - although I really have no idea what! 4. Do you get snow where you live? Not usually. There was a legendary snowfall here on Christmas Eve 2004, but I was in Austin at the time and it didn't snow there! 5. Do you sew/quilt more during this time of year? Well, I've been sewing the last few days and I hadn't been before that, so I guess this year the answer is yes. Typically, I don't think so, though. 5. 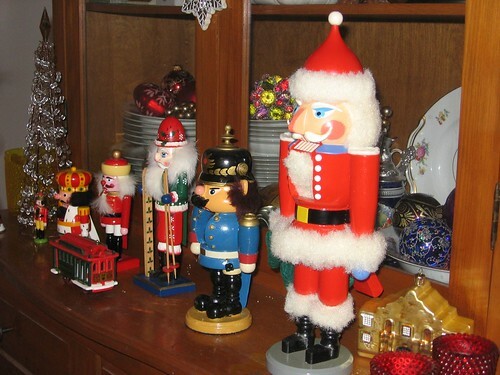 Are your December decorations still up? Part of them, yes, but I'm working on that. I had two (small) trees up - one is down and one is still up but I've started taking the decorations off. By my standards that's doing pretty well! I'm thinking it goes over the dining table. I have some blue & white plates that might look good with it, too. 2. 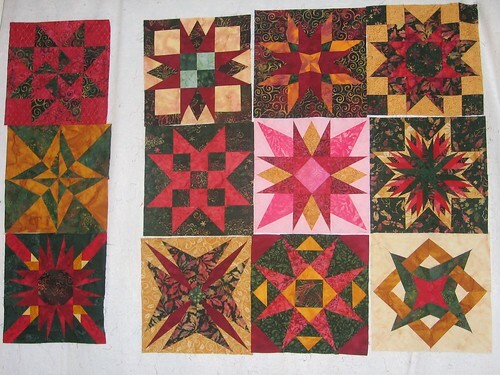 Do you make wall quilts for holidays decorations? I haven't so far, in 10 years of quilting. I have some more Christmas quilts in the planning stages, but up to now I've made exactly one Christmas quilt, and it was a lap quilt. 3. Eggnog or Hot Cocoa I don't like eggnog, so I guess cocoa wins by default. I'd rather have wassail, though! 4. Do you own any green/red notions? Except for pincushions, I don't think so. 1. Do you have a holiday stash? Yes, a rather large one. 3. Do you have a wish list that you share with family and friends? Not usually on paper, but I do let my husband know what I have in mind. 4. Are you done with your holiday sewing/quilting? All I have is one thing to do (a binding), and no, I haven't done it yet. 5. Red/Green/Gold or Blue/White/Silver? I guess I'd go with blue/white/silver, but I like both.